Spring Break Family Vacations Including Baseball. Why not? March is the month Grapefruit League in Florida or the Cactus League in Arizona to show their stuff. And for families who share a passion for baseball spring training is ideal – cheap seats, great weather, and close encounters with players. After each game Houston Astros' players meet fans at Autograpgh Alley. 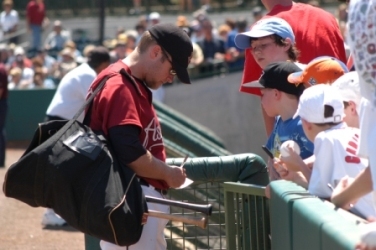 The obvious advantage – spring training games offer fans a less intense atmosphere with players willing to talk with fans, and sign autographs. From batting practice to the 7th inning stretch the atmosphere is convivial. Including baseball in your spring break plans is fairly simple. If any team will do then the options are many. Look to the Grapefruit League in Florida for Astros, The Braves, Blue Jays, Cardinals, Devil Rays, Marlins, Mets, Nationals, Orioles, Phillies, Pirates, Red Sox, Tigers, Twins, and Yankees. The ballparks are found in central Florida, along Florida’s east coast, southwest Gulf side, and the Tampa Bay area. For example: love the Astros then it’s Osceola County Stadium in Kissimmee; follow the Yankees the its Legends Field in Tampa. Add to ballpark time in Florida beach time along the Gulf, airboat rides, Harry Potter at Universal or horseback riding or ziplinging at Forever Florida. Each spring, Arizona hosts the Cactus League spring training with the teams in Scottsdale, Tempe, Surprise and Peoria. The teams training include A’s, Angels, Brewers, Cubs, Dodgers, the Giants, Indians, Mariners, Padres, Rangers, Reds, and Royals. A two-hour drive south, Tucson is home to the Rockies, White Sox and Diamondbacks play. Add to sunny days in Tucson a visit to the Arizona-Sonora Desert Museum, Colossal Cave Mountain Park, Sabino Canyon, Reid Park Zoo or Old Tucson Studio. For families vacationing in the Phoenix area offers plenty of activities to supplement any spring break. Start with the Heard Museum for a glimpse of Native American culture. The Children’s Museum of Phoenix, and the Arizona Science Center are definitely worth time plus the Desert Botanical Garden and the Phoenix Zoo offer hours of fun for families. Here’s the deal. Whether you choose Arizona or Florida the savings will be in the tickets. Ticket prices span $10 to $30 with family nights offering extra savings and benefits. Some teams offer the chance for fans to take batting practice or attend an autograph session. For planning purposes checkout www.grapefruitleague.com or www.cactusleague.com. Each site offers current schedules and ticket information.